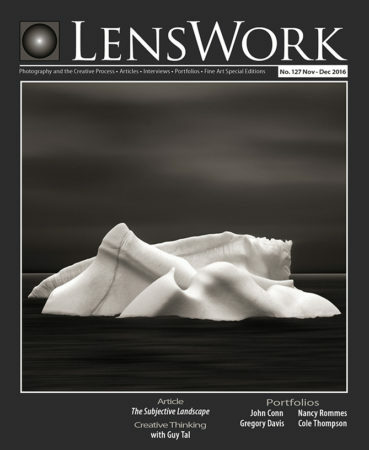 I consider LensWork to be the world’s finest photography publication. Why? Because of the quality of the artists they publish and because of the quality of the printing, it is spectacular! The quality is better than most of the photo books I’ve seen and I think ofttimes better than the original images. I’m not a print expert, but I do have a pretty extensive and varied print background: I worked in my own darkroom since 1968, learned digital printing in 2004 and I was an offset print buyer in the 1980’s and worked extensively with Gardner-Fulmer Lithograph (where I would run into Ansel Adams doing press checks). My point is that I know good printing and LensWork has amazing printing. Ask anyone who has ever seen a copy. You can subscribe or you can pick up a copy in selected bookstores. However I should warn you that because LensWork is physically shorter than the other publications, it often gets lost in the crowd. So if you’re in a Barnes and Noble and you don’t see it, check behind the other Photo Magazines. P.S. Sometime I’d like to tell a couple of Ansel Adams stories, including how I came to have a print of “Aspens” hanging in my home. If you have not seen it yet, this issue of LensWork is now on the newsstands. If you are fortunate enough to have a Barnes and Noble nearby, you can pick up a copy there. If not, I’d be happy to mail you a copy for $10, signed if you like. Just PayPal me at Cole@ColeThompsonPhotography.com with your mailing address. 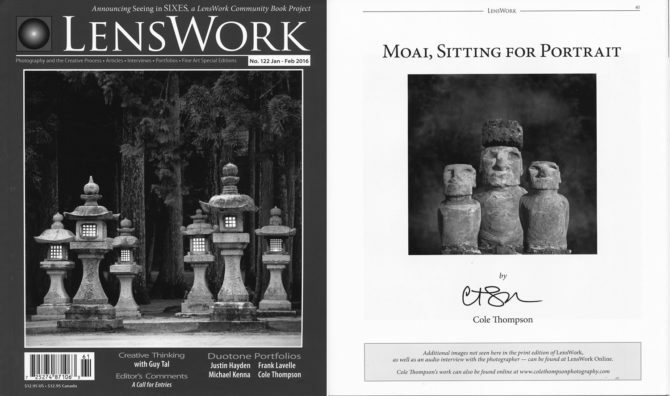 I’m honored to have my portfolio “Moai, Sitting for Portrait” featured in the January/February 2016 issue of LensWork. This is my fifth body of work to be featured and I’m very proud of that because I consider this to be the highest honor my work could receive. I respect this publication very much. If you’re not familiar with LensWork, it is in my opinion the finest black and white publication available. The quality of the photography is matched only by the quality of the printing. It is simply worlds above any other magazine. You can subscribe to LensWork or pick up a copy at Barnes and Noble. If you’d like a signed copy, I’d be happy to send you one for $10. Lenswork Daily featured a 3 minute audio excerpt from my interview with Brook Jensen regarding this image. My portfolio “Death Valley: Where Time Stands Still” is featured in the current issue of LensWork. It is always an honor to be featured here. If you’ve never seen a printed copy of LensWork, then you are missing out on one of the finest printed publications in the world. The quality of their duotone printing surpasses most of the photo books I own and the quality of their featured photographers is consistently high. And then there is LensWork Extended, a DVD with additional content such as audio interviews, additional images, video and even…dare I utter the word…color! If you were going to read just one photo publication, I’d suggest that you get rid of the ones that focus on equipment and subscribe to LensWork that focuses on art. At $39 a year, it is a steal and I’m not sure how Brooks Jensen can afford to do it! Here’s a new video featuring my Death Valley images. They will be appearing somewhere special in the near future. Here’s a hint; it’s a black and white publication.